I’ve come to a point in my life when I’m realizing I have to admit to something of a problem. I, like many knitters before me, have a yarn problem. I must have more of it. Unlike all too many knitters, however, I lack a huge stash of yarn (as of yet). But I have a plan. I am a process knitter. I knit because I enjoy the act of knitting. I don’t have a huge attachment to my finished pieces, but am happy to give them away (for the most part). But…there is the little detail of buying the yarn. So, I’ve concluded that it may be time to begin to make my yarn habit more sustainable. I’m beginning to make items which I will sell. Now, as any knitter can tell you, selling handknits is no way to make money. 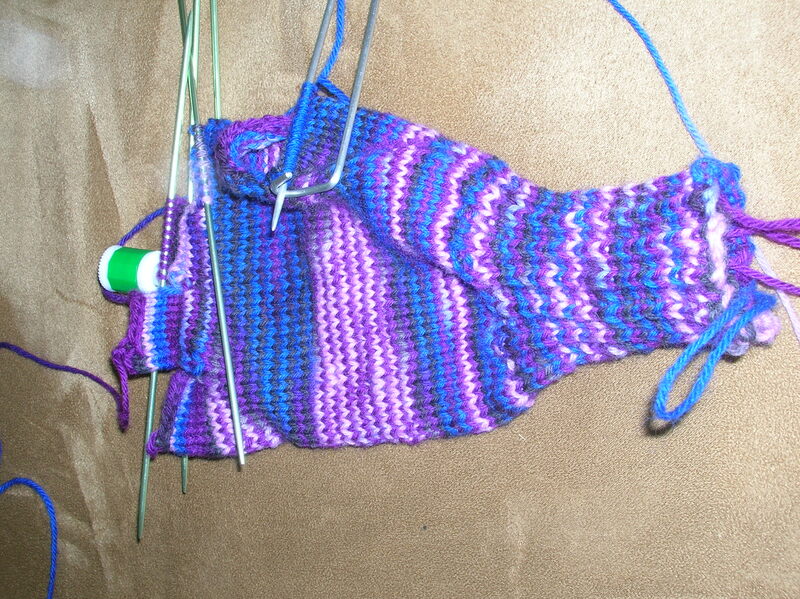 A pair of socks can take 20 hours or more to knit. The yarn often costs $15 – $20. No matter how lovely those socks are, you cannot sell them for an amount that will compensate for the work that goes into them. Therefore, they must be made with the understanding that they are being made for their own sake, and then sold not as a way to make money, but rather as a way to support a yarn habit. I, as most knitters I know, believe that we imbue the objects we make with something of ourselves. That the intentions and moods with which we make the objects is in some way inherent in the object. That when we are making an object for someone we love, we are filling the object with love…if only to the extent that when the person we give it to wears it they will feel loved by us because they know we knit something for them. The most explicit example of this is what is called in the (non-Jewish) knitting world a prayer shawl in the Jewish tradition, a prayer shawl is an object worn while praying. In the knitting tradition, a prayer shawl is a shawl made while praying…often made for someone who is sick, and the idea is that the prayers and good thoughts are conveyed to the individual when they wear the shawl. What, then, is the intention around items intended for sale? I’ve been working on a pair of flip-top mittens for sale. As I’ve been working on them, I’ve been noticing what I’ve been thinking and feeling. It has not been excitement over the money the mittens will bring in. It has not been disappointment over having to give up these mittens. There has been some sense of enjoyment of the yarn itself, and some sense of excitement about the yarns this will lead to in the future. And a sense of curiosity over who will wear my work. (Okay, admittedly there is a little stress over the fact that I’m getting ever nearer to making the mitten shell which requires US #2 DPNs (double pointed needles) and I haven’t made it out to the yarn store to purchase them yet–but without that bit of worry over something knitterly it wouldn’t be knitting, would it?). So, as I continue to knit on this project, and as I get ready for some larger projects I’m hoping to sell, I’m so far feeling good about this, and looking forward to see where it goes. And the pattern is the Broad Street Mitten at Knitty.com.